3.3 out of 5 based on 28 bloggers and 17 commenters. 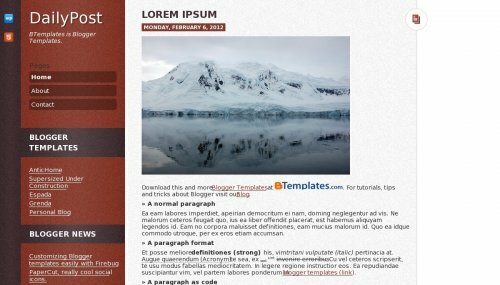 DailyPost is a free blogger template adapted from WordPress with 2 columns, left sidebar and simple look. This one’s a gorgeous minimalistic template for Blogger. Gonna modify and use it at my blog. Thanks for sharing. @Abu Farhan: I think it’s a good choice. Having a problem. Trying to set up the display in Blogger, but it only shows the main page and not the side bar? What to do? I don’t know why but my site does not show up like this :(. all the time the blogger used the templated.